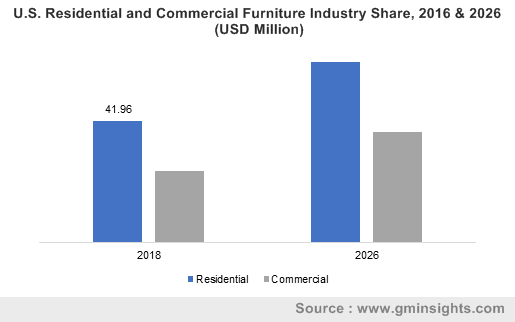 Global Furniture Market size is estimated to surpass USD 750 billion by 2024; according to a new research report by Global Market Insights, Inc. Rapid urbanization supported by high private and government spending on residential construction to accommodate the increasing population will boost the global furniture market share. Increasing remodeling service demand in the developed economies of Europe and North America will stimulate the industry development. Expanding tourism sector particularly in Asia Pacific, Europe, and MEA will propel the business demand. Trend towards outdoor living and garden dining supported by rise in social gatherings are augmenting the outdoor furniture market demand. Escalating outdoor restaurants demand will strongly support the business development globally. Increasing eco-friendly and smart furniture product launches will create new growth opportunities over the forecast timeframe. Reduction in size of new residential construction has paved the way for multipurpose and easily movable furniture. Enhanced distribution network along with penetration of new brands offering product at lower prices will enhance the volume sales. Design innovations along with rising disposable income will boost the luxury furniture market growth. Penetration of online stores in emerging economies will surge the business development from 2018 to 2024. However, skilled labor availability is among the major challenges faced by the industry. Wood furniture dominates the global market with 60% share in 2017 and is expected to continue its dominance during the forecast timeframe. Superior product finishes along with availability of extensive wood options including mahogany, Teak, Redwood, Fir, Cedar, and others are among the key factors driving the wooden furniture market growth. High durability and strength along with availability in lower price variants and higher-end segment will proliferate the wood material demand over the next few years. Preference in green buildings will positively influence the product sales. Commercial application is projected to be the fastest growing segment in the global furniture market. Commercial application majorly includes offices, educational institutions, hospitality, and healthcare sector. Hospitality and educational institutions are among the key contributors to the commercial furniture segment growth. Rising count of tourists in Middle East and Asia Pacific supported by increasing number of luxury hotels are stimulating the business expansion. Rapid commercialization along with rising household spending is driving the furniture business demand in emerging economies. Increasing service sector in developing countries is propelling the office furniture demand. Geographic expansion of multinational companies along with growth in retail network will boost the industry share. Asia Pacific is expected to dominate the global furniture market, accounting at over USD 400 billion by 2024. China, India, Japan, and South Korea are the leading markets in the region. Easy availability of raw material and economical labor supported by booming real estate sector are fueling the business revenues. Developing hospitality industry in Malaysia, Indonesia, India, and China will boost the industry growth. Growing balcony and outdoor furniture demand along with government spending on public infrastructure will enhance the business landscape over the next few years. Global furniture market share is highly competitive with presence of large number of domestic and global players. The key industry players include Ashley Furniture Industries, Okamura Corporation, La-Z-Boy Inc., Haworth Inc. Steelcase, Inter IKEA Group, Kohler Co., and Global Furniture Group. Other prominent players include the Home Depot Inc., McCarthy Group Ltd, Heritage Home, Herman Miller, and Humanscale Corporation. The key strategies observed among the industry participants include M&A, distribution channel, and design innovations. For instance, in June 2018, Herman Miller acquired a stake in Nine United Denmark A/S to expand its product portfolio.